I had a lovely note yesterday from Joan Wilson asking whether she could use my Fast Hat Four Ways pattern to make pink chemo caps in memory of a friend who had fought breast cancer for twenty years. Of course I said Yes! but it didn't seem like enough. Some of my friends and family have battled breast cancer, and a few have not won the fight. Every year, my cousins band together with a lot of other people willing to raise funds and then walk for two days during the Weekend to End Breast Cancer. The heroism in the face of this disease is incredible to me, and awe-inspiring, and quite often, even funny. Yes, I'm looking at you, ladies with pink and black feather boa bras on the outside of your T-shirts at rallies and fundraisers! Joan's group, The Fairy Godmothers of Fayetteville, North Carolina, got together nearly four years ago to knit preemie clothes, and now they've expanded their repertoire to scarves and lap blankets for local military veterans. 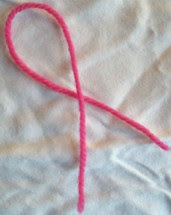 In March, they're going to be knitting chemo caps, and I'd like to challenge Hugs readers to do the same. Here's the deal: knit a chemo cap and take a picture of it and, if you're fortunate enough not to know somebody who needs it, donate it to your local hospital. E-mail me the picture and I'll enter your name in a draw. At the end of March, I'll draw a name and mail the winner autographed copies of three anthologies that have included my short stories--Going Out With A Bang, Blood On the Holly, and KnitLit--in memory of Mary Rose, Carole, and my Aunt Peggy. Joan kindly sent me a pattern of her own design to share, and I might have a chemo-related freebie up my own sleeve as well... but you'll have to stay tuned for that! March 24 update: the caps are rolling in and I know there are even more knitters who haven't sent their pics yet, or feel that doing good is reward enough without a prize draw. It is, of course, but the draw is a celebration of the lives of three terrific women and a chance to have some fun, too. So be sure and share those Finished Objects - just 7 days left!